Our last reef cleaning of year 2012 took place at Bogy Faru, a reef close to our neighboring island Himmafushi. With 4 guest participants as well as 6 staff volunteers, over 40 kg of rubbish was hauled out. Findings included a few car tires, as well as the usual; plastic bottles, cans and fishing line. 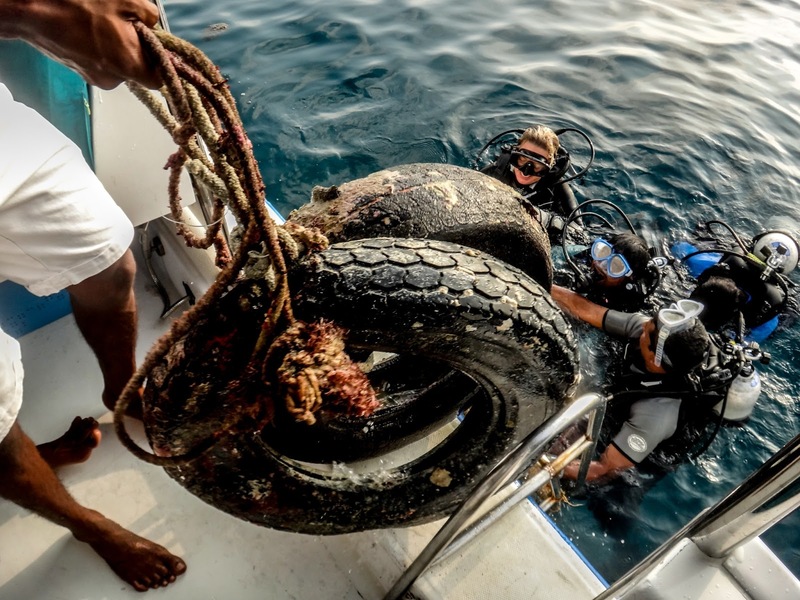 This month for your attention we also post a link to a report called “Untangled”, which gives you a great overview of the global situation with marine debris issue, with a focus on animal welfare. This report has been produced by World Society for the Protection of Animals. You can read by clicking HERE. We also kindly invite you to show your support to an organization called “5 Gyres” which studies plastics pollution and educates people worldwide. You can show your support by simply signing the “5 gyresplastic promise” here, or by donating to this organization.